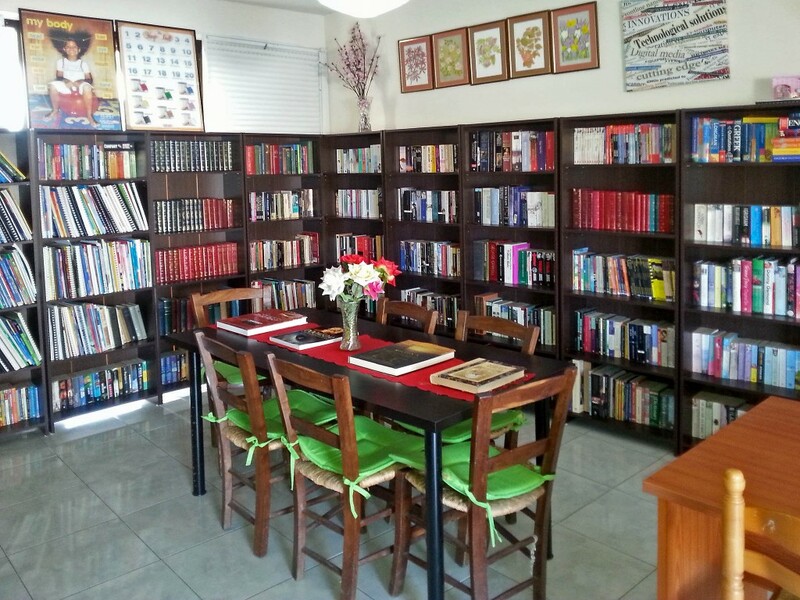 The owner of Empire Education Centre, Deanna Tsikkou, is an experienced English Language and English Literature teacher and trainer, qualified in both British and American academic systems. Deanna Tsikkou is a British national and all of her English teachers are also professionally trained native English speakers. 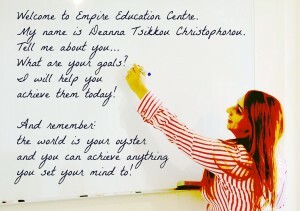 Prior to the establishment of Empire Education Centre in 2012, Deanna Tsikkou served as Head of English at a private school in Cyprus. 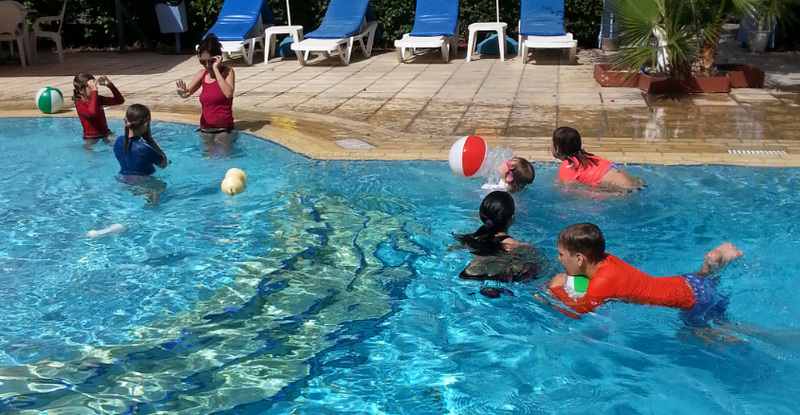 Learn Learn English in an enjoyable, family-orientated environment! Empire Education Centre is certified by the Cyprus Ministry of Education and caters for students of all ages, starting from the age of 2. It is open daily from 8:00 am to 8:30 pm. 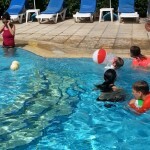 Both group Lessons and private lessons are available. 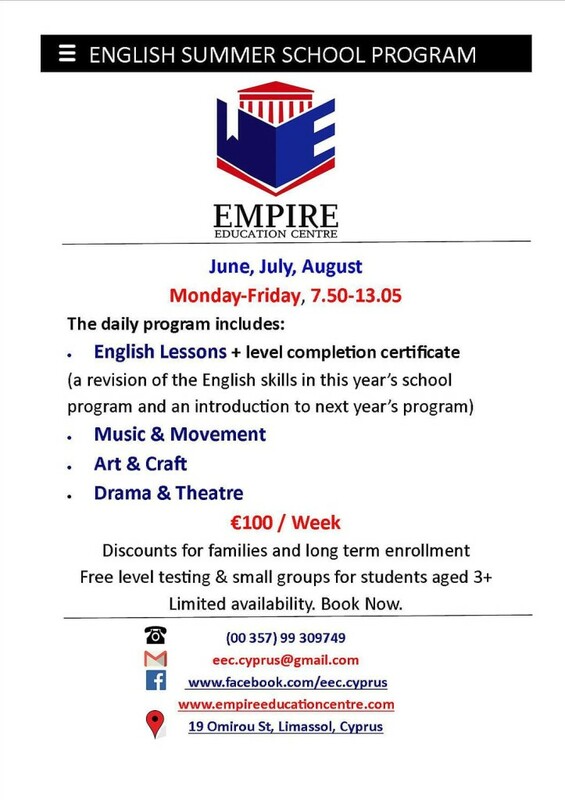 Empire Education Centre is a small English school located in the town centre of Limassol and all groups have a small number of students so that the teachers can give adequate attention to everyone. 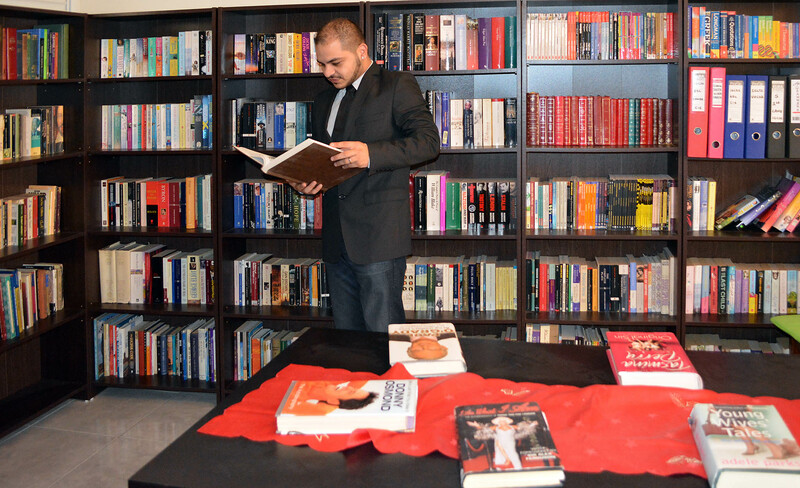 There is also a well-equipped library where our students can sit and read a book, or borrow a book to read at home. 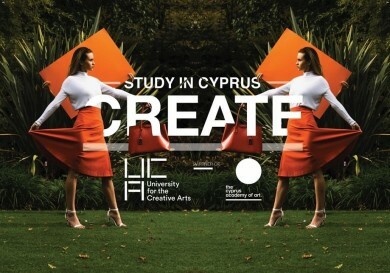 The vast majority of our English students are Russian speakers that either come to Cyprus on holiday to study English or live in Cyprus permanently. All of our English teachers are British and speak with a clear English accent, thereby teaching correct phonics and pronunciation to our English students. All of our teachers use differentiated methods of teaching, particularly when a student faces learning difficulties like Dyslexia. All English teachers explain English rules in class and do many speaking activities – written work is usually given as homework to see if the students have fully understood the material that has been covered in class. English teachers ensure that all students are well-trained in Speaking, Listening, Reading and Writing skills by the end of each course. We are therefore very proud of our English students because they have a 100% success rate on all internal and external examinations. A free English Language level test will be given to all students upon their enrollment at Empire Education Centre and an English Language progress test will be given at the end of the course to examine the success of the course. Based on the level of each student or group, special English courses can be tailored to improve the English Language knowledge of new students. Certificates of Completion (for pass marks) and Certificates of Achievement (for distinction marks) will be awarded at the end of each course. 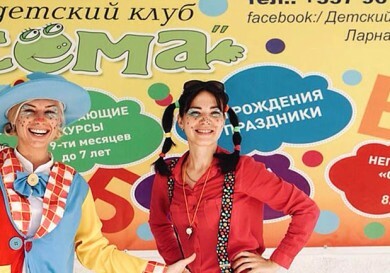 Learn the English Language and have fun! Perfect your English Language skills through our tailored English courses which cater for every English level and all ages. Our native British teachers offer students an invaluable opportunity to excel in English Speaking and Communication, English Listening skills, English reading comprehension, English writing processes, as well as English grammar and vocabulary. Each day the children will have a new topic to focus on and create a debate for speaking communication. All teachers are native English Speakers and they will teach the students phonics and pronunciation rules. Topics of interest will be used for writing practice. For instance, formulas will be shown regarding letter writing, news reports, magazine articles or even analysis essays (once again depending on the level of the students). Reading sections will have a wide variety of topics taken from fiction and non-fiction texts (depending on the ages and levels of each individual group). 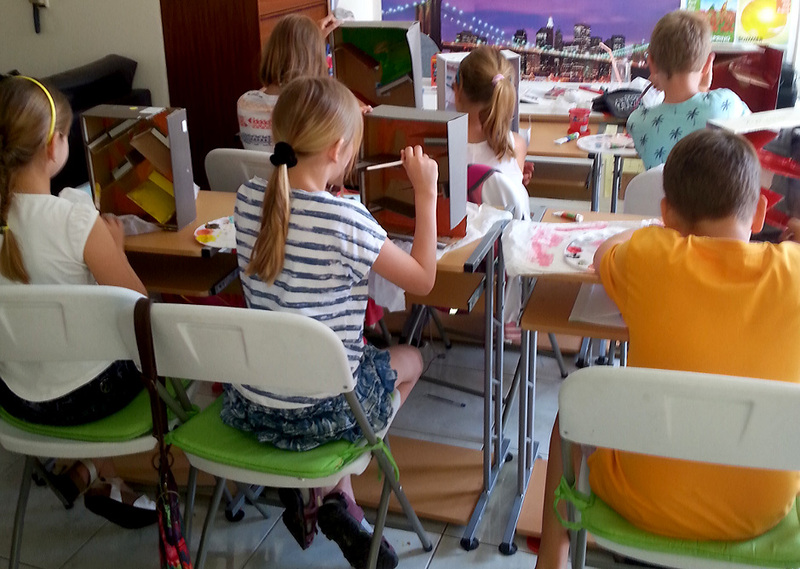 In addition to learning English, summer school students will have the opportunity to participate in an art and craft workshop. Depending on the age and gender of the students, they will be given both freelance and instructed art work to complete including papier-mâché, painting, crafting, as well as making sandal and jewelry designs. 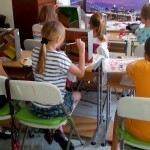 An Art Competition will occur at the end of each course for the best compilation of art work. Summer school students will also perform English karaoke. The most successful way to learn how to communicate in English and build speaking confidence is through English Karaoke. Students will use rhythm to learn how to perform English karaoke songs of their choice. Summer school also includes an English drama club. Modern and Classical drama will be watched and performed by our students. This is also a fun way for students to learn how to communicate in English with their peers and build their speaking confidence. LESSONS HAPPEN AT YOUR OWN OFFICE! Are you a business owner and are you interested in improving your employees’ level of English? 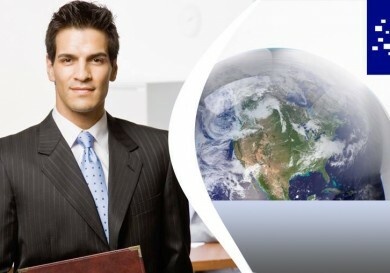 It has become a trend for global companies to help their employees improve their English Language skills. 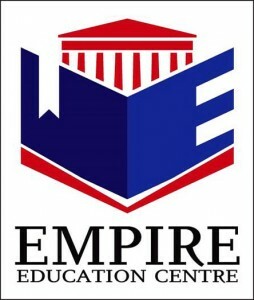 Empire Education Centre comes to your own work place for group lessons or private lessons. This is more convenient for your employees because lessons can be scheduled to fit their working schedule and they do not need to even leave the office. Empire Education Centre specializes in providing English courses for different industries and companies in Limassol and has a lot of experience with international Business professionals. Quality courses are guaranteed. Improve your business qualifications by mastering the Language in Cyprus and gain a competitive advantage over business rivals. This course includes English Language training for effective spoken communication, business presentations, written communication and English proficiency for overall confidence building. Our small groups ensure that each student receives the maximum level of assistance and attention. Our native British teachers offer students an invaluable opportunity to excel in English Speaking and Communication, English Listening skills, English reading comprehension, English writing processes, as well as English grammar and vocabulary. Have you learnt English before in the past? Do you want to refresh your knowledge? We can help you fill in the gaps of your English Language knowledge, as well as give you the opportunity to refresh your memory. Our students’100% success rate on all external examinations is something that we are especially proud of. We put all of our heart and soul into ensuring that every student meets their full potential in the English Language examination of their choice. Join us and succeed in passing all formal British and American examinations to secure entry into international universities. Our small groups ensure that each student receives the maximum level of assistance and attention. Our native British teachers offer students an invaluable opportunity to excel in English Speaking and Communication, English Listening skills, English reading comprehension, English writing processes, as well as English grammar and vocabulary. Children aged 2 – 6 can meeting their linguistic and developmental milestones enjoyably through English music and movement, including dancing, drama and art. The younger a child becomes exposed to the English Language through fun activities, the easier it will be to begin formal English language classes at the age of 6. Give your child the opportunity to have a strong start in the English process. Our small groups ensure that each students receives the maximum level of assistance and attention. All English levels and English classes are offered in an enjoyable classroom environment which allows children aged 6 — 18 to reach their full potential in the English Language. Our native British teachers offer students an invaluable opportunity to excel in English Speaking and Communication, English Listening skills, English reading comprehension, English writing processes, as well as English grammar and vocabulary. 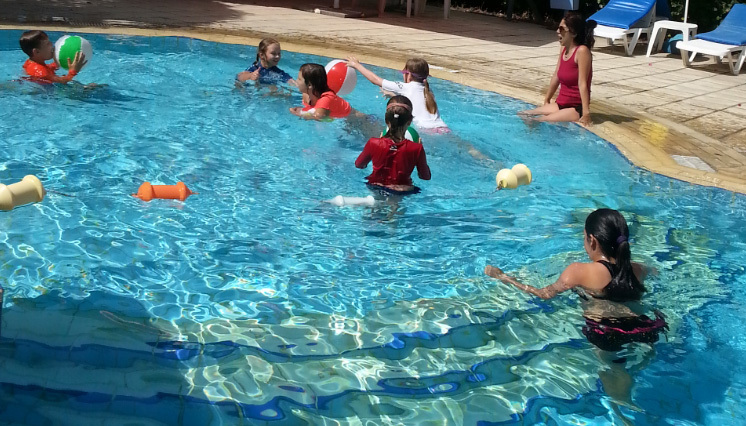 Our small groups ensure that each students receives the maximum level of assistance and attention. Do you live outside Cyprus? We offer our specialized English lessons through SKYPE and all homework can be submitted via email or our social media pages. Learning English from home has never been easier! Get quality English lessons from the comfort of your own home. Are you interested in being a writer? 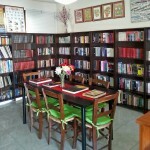 We can assist you in developing the necessary creativity and writing skills necessary to become an effective writer. We assist students in understanding key literary concepts in the study and analysis of English literature texts. Texts include classic and modern English Literature. 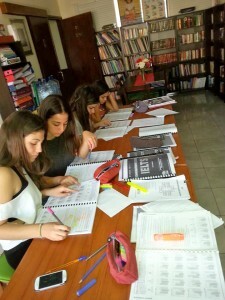 Upon completing their course, students have the possibility of taking IGCSE and A’LEVEL literature examinations for university admission in the UK. Having difficulty completing essays, presentations and dissertations in English? We can assist you in perfecting your writing and communication skills to gain a competitive advantage over other students in your course. 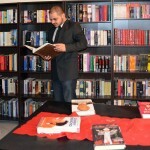 We assist university students in the research process as well as the writing process of their university assignments. We also edit university papers and dissertations for students that have problems with their English writing. 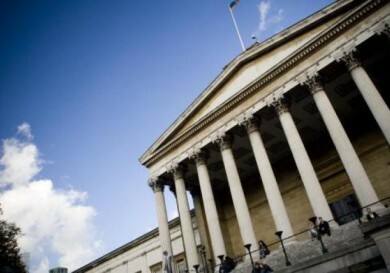 Are you planning to attend university in an English Speaking Country? An effective personal statement can assist you in gaining a competitive advantage over other prospective applicants. We can assist you in creating the most attractive and effective personal statement. Does your child attend an English school? Is your child having difficulty completing his school homework? Our teachers will assist students with academic difficulties with homework to ensure that they fully understand their school curriculum. 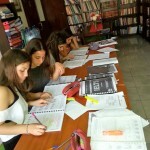 We also offer exam revision classes for students of all ages. We can translate all types of documents, including reading books, from Greek to English. We strive to have the most competitive prices in the English Language market in Cyprus and we also help families with financial difficulties.